We’ll pick it up for you, you’ll have a hefty tax donation sent your way, and RMHC families benefit! If you think that old car in your driveway isn’t worth much, we would like to turn that thinking around. 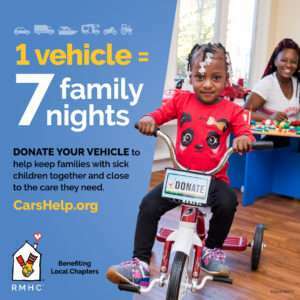 By donating your car, truck, boat or RV to Ronald McDonald House Charities of Greater Las Vegas, you can help us in our mission of keeping families close here in Las Vegas. On top of that, you can claim a tax deduction for your charitable donation. We’ll even come pick up your vehicle at no charge. To donate your vehicle, or to learn more about the program and how it helps, please click on this link to donate your vehicle to RMHC of Greater Las Vegas, call toll free at 855-227-7435. For more information, please email events@rmhlv.org or call her at 702-252-4663. We have many other ways you can donate to our mission here at the Ronald McDonald House Charities of Greater Las Vegas.